Discussion in 'Fan Art' started by Nerdy McNerdface, Apr 19, 2017. Yo, try wrapping plain old [* IMG]tags on those puppies, it might fix your problem. I'm happy to see that you're improving! I hope that you're still drawing, because of Insta's new algorithm I swear I don't see anything I actually want to see anymore, because those two last drawings are completely new to me. Heya, been a while since I saw you in this thread! I’ll probably put the tags around them soon, once I can be bothered to go through an entire thread’s worth of pictures and edit every single one of them. Those last two are up over there, so the algorithm screwed you over then. I’m proud of the second one though! And to answer your question, I’ve been taking a little bit of a hiatus due to lack of motivation and the ultimate procrastination fuel aka Legend of Heroes Trails of Cold Steel arriving so yeah. I’ll probably get back to drawing once I’m done with this game, which shouldn’t be too long now! Heyyyyyyyy so I’m not dead! I’m gonna sort out the bbcode for the rest of my Gallery once I’ve posted this. And what is “this”, you say? Well, two drawings! 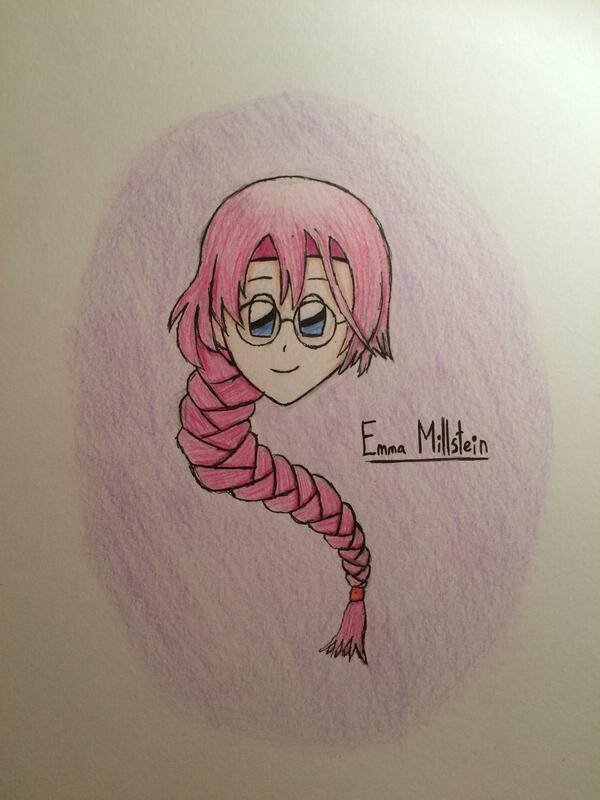 The first is just a little headshot I did of Emma Millstein from Trails of Cold Steel. She’s not necessarily my favourite character, but she’s definitely pretty cool! I really tried to nail her plait down, and I think I did my best. The other drawing is something I’ve been working on over the last few days. Since finishing off Dragon Age: Inquisition, my best boy focus has... somewhat shifted, aka I gained a ton of love for Cole in the process of finishing off the game and reading Dragon Age: Asunder. 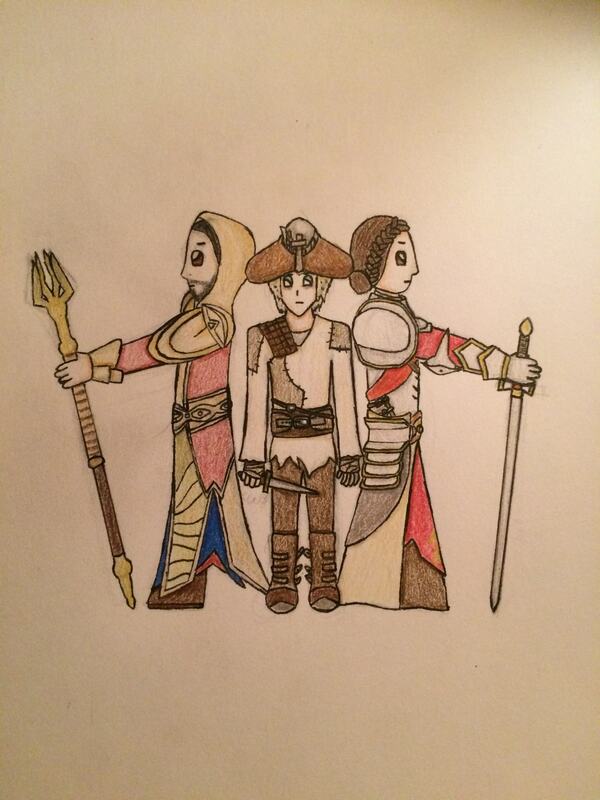 So I drew him - but not just him, I also drew the other two focal characters of the book, Rhys and Evangeline! In side profiles, no less! It was pretty difficult to nail down everything, but I gave it my best shot and it looks pretty good to me! Not one, but two drawings! Right off the bat, I'm just going to say that I love pink hair. It's just awesome. Also, that plait is pretty amazingly detailed (although I can't necessarily judge on female hairstyles). That's really good though! Cole is such a cool name. As for the drawing, it's incredibly detailed, and side profiles are actually quite tough. A few bits though: Cole's thumbs seem a bit off to me, and I'm not sure if it's just his cloak, but the angle on Rhys' foot is kinda making me frown. Overall though, two amazing pictures that really show just how much you've improved as an artist! You did full body stuff!!! Like, not just chibi but actual full body! (Look at my baby, branching out. They grow up so fast...) I really love the composition, and as usual your coloring skills are on point. The facial structure on these bois is pretty good too! I would just say that the left guy's body structure is at a weird angle, like he's leaning back. Feet are usually in a straight line down from the spine if characters are standing straight up. All of these bois are also looking just a tad stiff. As you progress in your work, try to be a little more dynamic! Break the structures and stiffness! Curved lines are your friends! Onwards! Upwards! Forwards! Keep going! These are the drawings that will make the future BRIGHT! Pink hair is awesome, I will agree, it’s really underrated. I’m happy you like the detail! Cole is an awesome name, and it was given to an awesome guy. I learned that side profiles are hard the difficult way, but I’m happy with my result, and I’m happy you like the detail. His fingers are sort of meant to be kind of off as his whole thing is looking unnaturally dishevelled and thin, but I get what you mean there. I noticed the foot thing, I will admit something went wrong. It wasn’t bad for a first try though! And it always makes me smile when someone says I’ve improved so much, as I really can’t help but agree! I’m happy I’m back too! I took a long hiatus that wasn’t helped by a bad cold, but I’m doing things again. I made it more disembodied because I wanted to ease my way back into drawing, so yeah. I’m really glad you like the plait! I wanted to try my best to make it look like the one in her official art while still sticking to my style, and I’m happy it turned out good! I’ve been wanting to do more fullbody for a while now, so that’s why I did that. (I’m happy you’re so proud of me *cries*) The colouring was particularly difficult on this one as I had to try more metallic shading to bright colours to more dull beiges, and it really gave me quite the challenge! I’m also happy with the facial structure, I actually took a side photo of myself to get an idea of how to make it work, and kept the photo almost as a relic. I mentioned my thoughts on the foot further up, so yeah. This was my first side profile in literal ages, so I am thinking of making them more flowy next time now that I have a somewhat better grasp on them! And I will make friends with those curved lines, I swear! So it has been a while since my last post, but this time it was less hiatus and more, well, I forgot to post my drawings here. But I remembered now, so here we go! 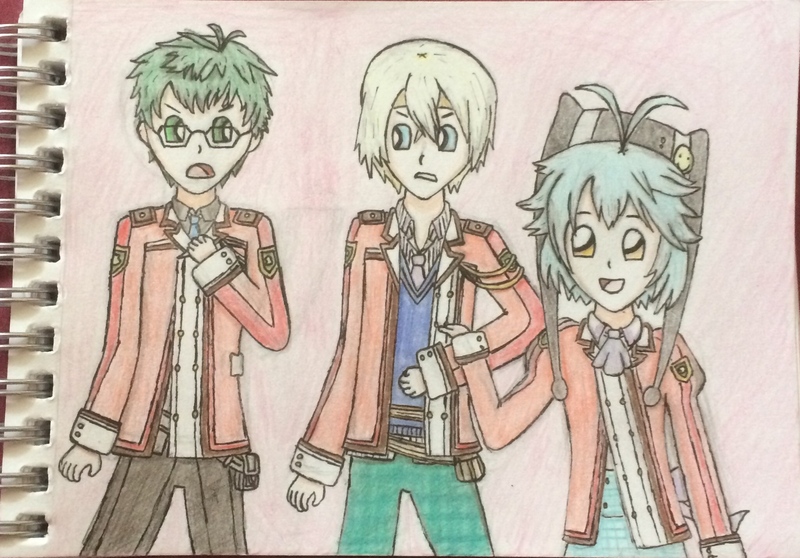 Today I have two drawings of my two Trails of Cold Steel children. 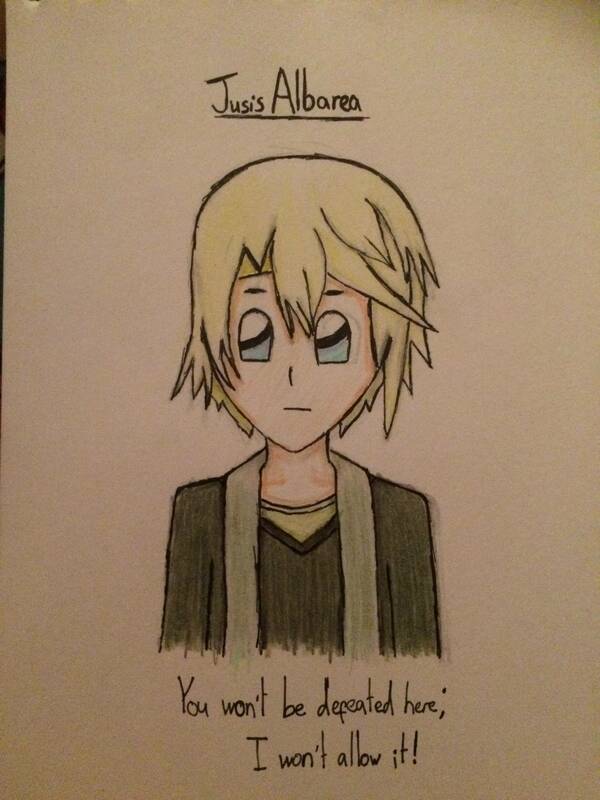 First up is the guy in my avatar, Jusis Albarea. I love this guy like you wouldn’t believe, he’s got such an interesting character arc! And he’s only trying his best, please stop him from suffering. Anyway, I did actually do two drawings of him, but I wasn’t that happy with the first one so I did a second one yesterday of him in his DLC outfit. I think it came out pretty well! My second picture was actually drawn about a week ago now, but like I said I forgot to upload it. My other good child is also the person I ship with Jusis, Millium! She is one of the cutest characters I’ve ever seen, and she’s also a perfect example of a comedy relief that doesn’t go too overboard and actually does something while also having a good character arc. As for my drawing, I’m extremely proud of it. Millium might as well have been born for my art style, she fits in it so well! Yo yo, it’s your boy (not Guzma), and time to check out some more art! Right off the bat, I’m gonna say that I was just waiting for a Jusis drawing, and you did not disappoint. He seems like a really interesting character, and while his appearance isn’t all that detailed, it feel as though that says a lot about his personality. Also, I love what appears to be collarbone shading, which is a lovely subtle design which I can’t help but smile at. Good work! Secondly, cool name Millium. So, she seems nice; I live the vibrancy of her hair, and the detail on her jacket gives a good feel of the positioning and curve of her design. I don’t get what that thing is around her head but it’s pretty freaking cool, to be honest. I prefer this to the Jusis, but only because she’s got more detail and I know less about her. As for shipping the two, is there any evidence to support it, or is it just on a whim? I’m interested! Right off the bat, I’m gonna say that I was just waiting for a Jusis drawing, and you did not disappoint. He seems like a really interesting character, and while his appearance isn’t all that detailed, it feel as though that says a lot about his personality. He actually does have a more detailed design, but I drew his much simpler DLC one because it was much easier to do late at night (his DLC outfit isn’t that detailed compared to the others though, so it’s still interesting in that way). And yeah, he’s quite interesting. You don’t want to get me started on my theories for the upcoming game. Also, I love what appears to be collarbone shading, which is a lovely subtle design which I can’t help but smile at. Good work! I just felt like doing that because why not. I’m glad you like it! I agree! Her non-romanised name can also be read as Miriam, which I find quite cool. So, she seems nice; I live the vibrancy of her hair, and the detail on her jacket gives a good feel of the positioning and curve of her design. I don’t get what that thing is around her head but it’s pretty freaking cool, to be honest. I prefer this to the Jusis, but only because she’s got more detail and I know less about her. I like her hair in-game too, it’s really vibrant, and I’m happy that came across in my drawing. I get what you mean with the jacket, I tried really hard to convey the feeling of optimism and excitement that’s normally in her official art. It’s kinda like a ring-hat thing, and I agree, it’s really cool! I explained about the detail thing further up, so yeah. As for shipping the two, is there any evidence to support it, or is it just on a whim? I’m interested! I answered this already in PM, but I’ll say for others curious: yes, there is evidence! A lot of evidence! It might even be one of those relationships that’s important to the plot! Also it’s just really cute anyway. It’s not quite canon but implied quite a bit. So I’ve got a new drawing today! 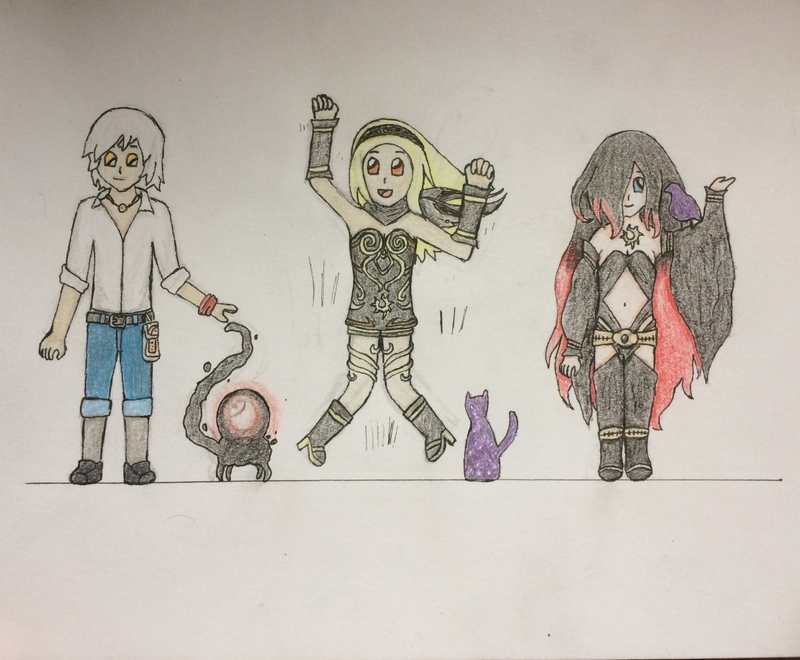 I somehow ended up back in my Gravity Rush phase, and I ended up doing a drawing of the main three protagonists. Gravity Rush itself is such a great game; the plot’s a little crazy but awesome at the same time, the characters are developed enough for me to really care for them, the art style of the drawn sections is stunning, and that’s not even mentioning the god-tier Gameplay. 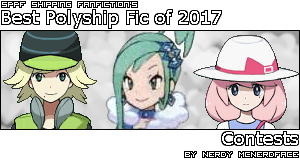 The main three characters especially caught my eye because of the stories they end up telling, not to mention their firm friendship which is just really cute. As for my drawing, I wanted to do some pose practice, and I think I did well enough for someone who isn’t normally as expressive with how their drawings flow. However, there are two spoilers.. One is from the sequel, but since it’s only a rather minor one it should be ok to click the spoiler tag for that one. The other one is a little bigger, but it’s from the first game and is rather predictable. The Nevi are naturally passive creatures, and Raven ends up allies with the other MCs. Woot more drawings! Love the guy on the left, there's a cool air to him, and that wisp of black awesomeness is actually quite intriguing. There's a sort of minimalist detail to it, and the glowing orb has been shaded brilliantly! Middle girl. So the legs are a bit... Bodged. But who cares? I love that you're experimenting with new stuff, and she just looks so happy there. The purple awesomeness looks like a feline nebula and I love it. Raven is raven. Enough said there. (My favourite of the three) Amazing, and the pose with the arms one of your best yet! Tbh I love him too, he’s gotta be one of my favourites. The wisp of awesomeness is awesome, I agree. I tried to give it a unique vibe, and used some colouring techniques I don’t normally use. I’m happy you like it! Yeah, there was something off about her to me, you’ve got it. Legs are one of the things I’m still learning how to pose more adventurously. She’s a very happy gal! The feline nebula’s pretty cool, I agree. I tried my damn hardest to make sure it actually looked kinda space-y, and that took lots of effort and hair pulling (and so did the rest to be honest). Aaahhhh thanks! I’m rather proud of that arm posing, I wasn’t sure I could get it at first. Hellooo! So I went on another hiatus because I went on holiday, but to make up for it made two doodles this evening! 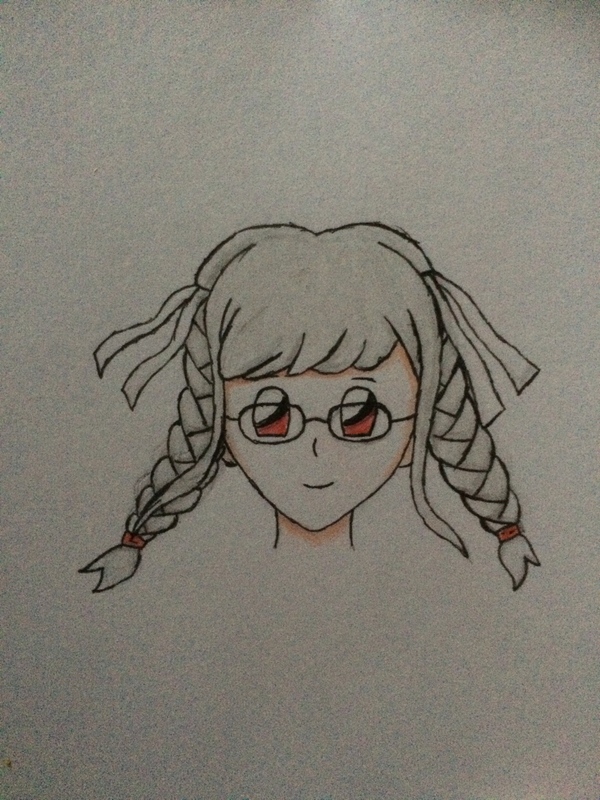 The first is a little doodle of Peko from Danganronpa 2. I haven’t played it yet but know what happens, and I think Peko is pretty awesome, but what pushed me to draw her was the fact that she kind of ended up an inside joke between me and some people on Instagram. Either way, I drew her, and I think it’s pretty cute! 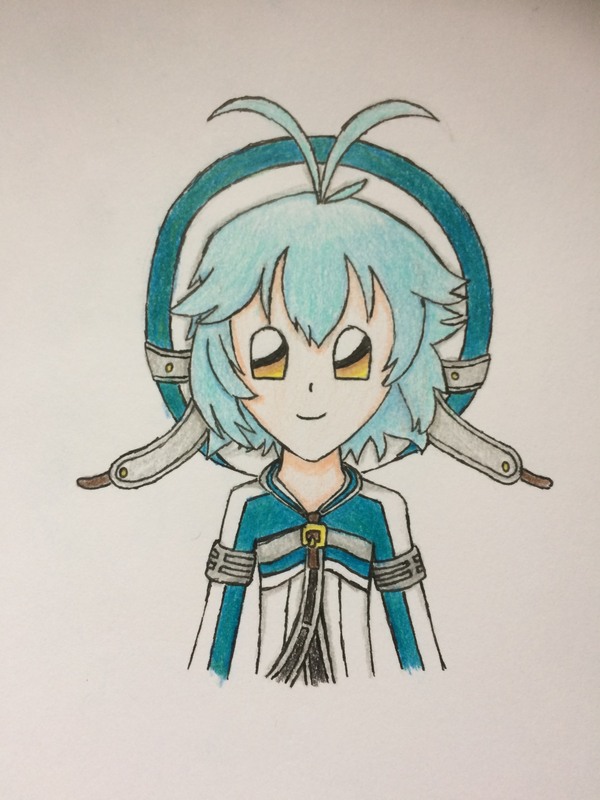 The second is a drawing I promised to do on Instagram of a character from the Trails series. I ended up settling on one of the important villain characters, Campanella. I haven’t played one of the games with him in yet, but he’s showing up in the one I’m buying next and I can’t wait to get to know him! He’s such an interesting character in that he’s just one huge enigma and the fandom knows barely anything about him at all, so that’s exciting. Either way, this was just a small doodle, but I tried something new in making the hair more detailed, and I think it looks kinda nice! It’s a-me, here with another art-a review for-a you! First off, little Peko reminds me of so many people at once that it’s unreal. Pretty much most of the Sheikah in BotW, and Misako in Ninjago, to name some. But I really love the detail you’ve put into the hair on this one. A great piece of work, as per usual. What is it with you and green-haired people? Actually, he looks like a bit of a cross between Cheren and N, with a cool tattoo thing. Anyways, this character looks awesome, and I have to say, my favourite part has to be the extremely subtle shading underneath the curtains of hair. Bravo. Brilliant work Nerdy! First off, little Peko reminds me of so many people at once that it’s unreal. Pretty much most of the Sheikah in BotW, and Misako in Ninjago, to name some. But I really love the detail you’ve put into the hair on this one. A great piece of work, as per usual. What is it with you and green-haired people? I don’t know! I swear every time they’re always the most interesting characters. There’s a protagonist in Trails of Cold Steel with green hair who I really like too, it’s getting ridiculous. Actually, he looks like a bit of a cross between Cheren and N, with a cool tattoo thing. I can see why you’d get that vibe! He’s not nearly as merciful or kind as either of them though, sadly. Anyways, this character looks awesome, and I have to say, my favourite part has to be the extremely subtle shading underneath the curtains of hair. Bravo. Brilliant work Nerdy! Thank you! I really wanted to do his hair well as I’ve been wanting to draw him for a while because of his awesomeness hair alone. I tried some new things and apparently they paid off! Soooo, around Mid-March, I started a drawing, but lost motivation to continue it. Today, I finally picked it up again and finished it... it’s one of those wrestling square things! 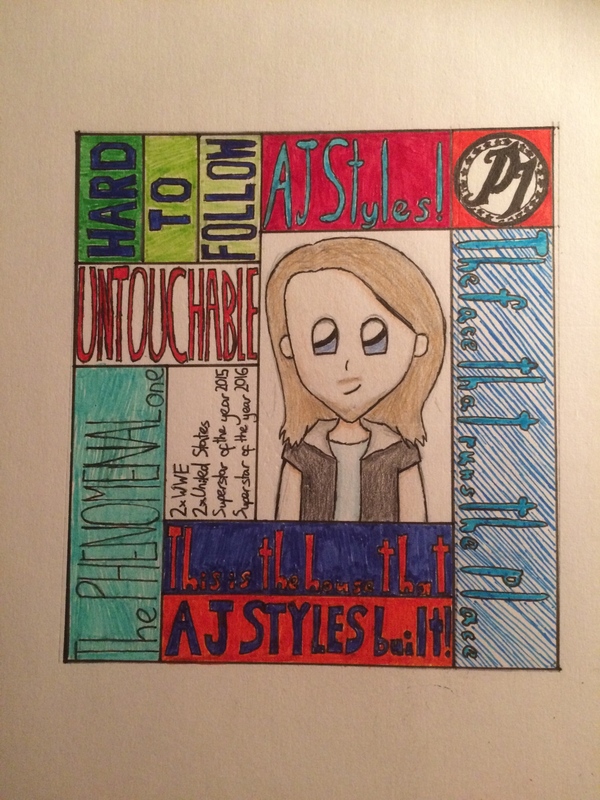 This one was of AJ Styles. Not necessarily one of my all time favourites, but he is really cool. I think it looks pretty good! Doing the logo in the top right was difficult though. Yoooo I’m back! I was ill for a few days and I’m still recovering, but I did a drawing and I’m proud of it, so it’s gonna be posted! So I was chatting with an online friend on Instagram who likes Trails of Cold Steel, and I mentioned I was gonna do a drawing but didn’t know who. As we both share common favourite characters they suggested I draw Jusis and Millium (who I have already drawn and have posted images of here), and I said it was a good idea, but also decided to add in another character - Jusis’ rival Machias. 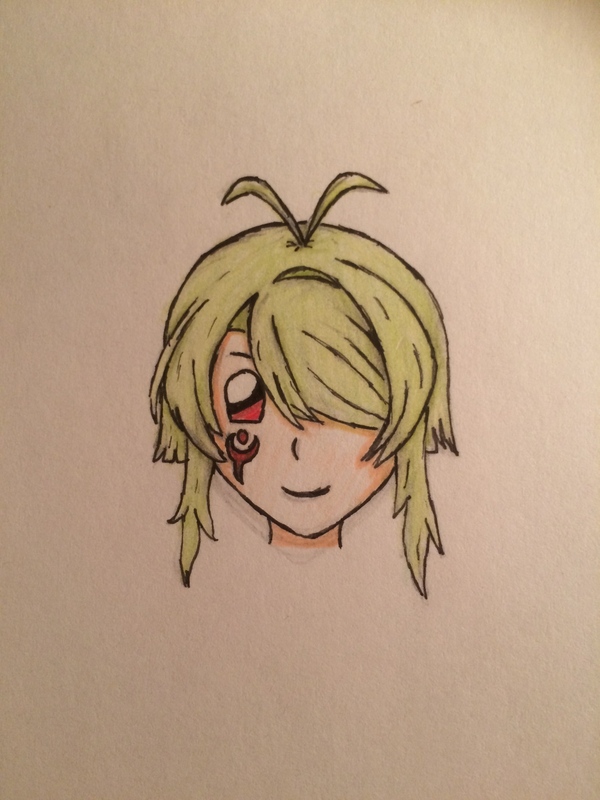 I drew it in my A6 sketchpad but it actually came out really well for such a small canvas to work on. Semi-related but Jusis, Machias and Millium are one of my favourite video game character trios and I would die for them. You’re back, I’m back, let’s get reviews done! Pretty much say the same thing for all of these wrestling ones. BAM! That’s a whole lot of colour. I think it’s quite good to see you putting more stuff into your pictures than just a person. I have to say, that logo in the top right is very professionally done, and it’s obvious that it took some time. Wait... What is this... This isn’t a bust drawing. It’s a... FULL BODY SKETCH. WOW. Actually, just wow. Did not see that coming. And not just one, but three. Now we can really see your horizons broadening. All of them are really well drawn, and I can see that you’ve definitely spent a while on it. The hair is, as always, brilliant, and most of your body proportions are pretty good! I just love the detail you’ve managed to do. If I had any criticism, it would have to be that Millium’s hand is kinda floating above Jusis’ arm, and both Jusis’ and Machias’ spare hands just seem a little off. Other than that, there isn’t anything else I see. Well done Nerdy, probably your best yet. Yoyoyooooo! I’m glad you like the colours, my fineliners are one of the best Christmas presents I’ve ever gotten. I like to do it too, I also think it fits the WWE aesthetic in general, having all the words around it. I’m so happy you like it, I was so scared I’d mess it up. Wait... What is this... This isn’t a bust drawing. It’s a... FULL BODY SKETCH. I mean, their legs weren’t fully featured, but that might still count? WOW. Actually, just wow. Did not see that coming. And not just one, but three. Now we can really see your horizons broadening. All of them are really well drawn, and I can see that you’ve definitely spent a while on it. The hair is, as always, brilliant, and most of your body proportions are pretty good! I just love the detail you’ve managed to do. *starts screaming* thanks so much!! I’m trying to become more confident in drawing characters’ bodies, so I’m happy you like em. I love shading hair, it’s one of my favourite parts of drawing. Hmm, not quite sure what you meant here. Her blazer cuff is white, which may make it look kinda floaty? Sorry, this ones going over my head a little. and both Jusis’ and Machias’ spare hands just seem a little off. I dunno how to draw hands better. While they’re not exactly a weak point of mine, they’re not really a strong one either. I’m gonna try and learn though! Other than that, there isn’t anything else I see. Well done Nerdy, probably your best yet. Thanks again! I put it up on my wall. Soooooo I’m not dead with my art! Over the last couple of weeks I’ve been playing this JRPG called Akiba’s Beat. It’s not a masterpiece by any means, but certain things about it just made me fall in love with it a ton. 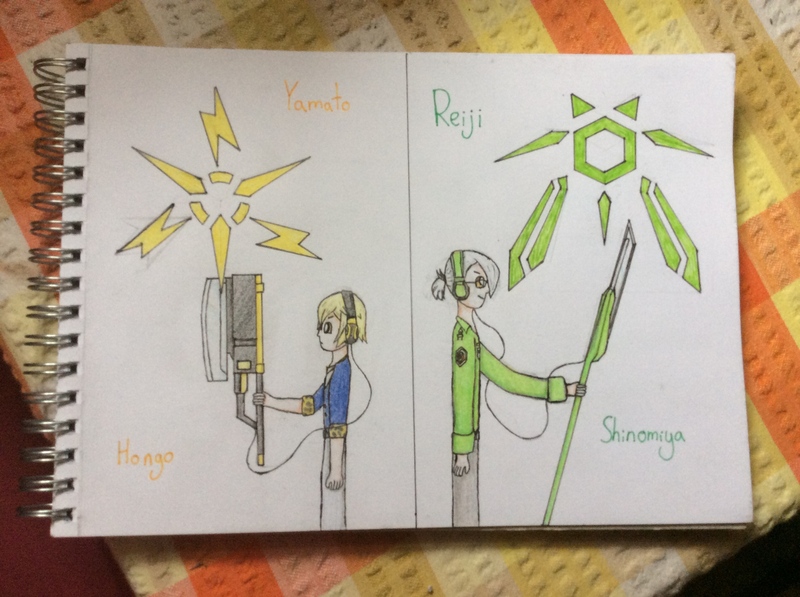 One of those things was the characters, which leads me to today’s drawing - my two favourite characters, Yamato Hongo (left) and Reiji Shinomiya (right)! I found these two had the best characterisation out of the main cast by far, as well as a fun dynamic that kept me entertained throughout the time both were in the party. I tried a side profile again, as well as some logos, and while I think some things were pretty good, I still can’t draw arms. For the life of me. Yo! I feel like I should give an honest update about this gallery. I have NOT stopped drawing by any means - I’ve actually been drawing more than ever, did a good portion of Inktober as well - but this gallery took a lot to maintain. I’d have to upload the drawing to imgur, then copy the direct link, then reply to whatever message I had before, THEN write out my thoughts on the drawing before I posted it. It became rather exhausting, and I just couldn’t keep it up, and now my backlog is wayyyy too big. So, while I’m not closing the thread as I might come back, I’m going to tentatively put it on long hiatus. If you want to still see my art, I’m on both Instagram and Twitter under the name geeky_mcgeekarm. I’m not going off the forum entirely, don’t worry! I just won’t post art here for the foreseeable future.